Unofficial exports over the border to China will face technical barriers since the two nations have agreed to limit them and increase official exports, heard a recent seminar in Ho Chi Minh City. A central Vietnamese port city made infamous by a war that ended more than 40 years ago is now stepping up to compete with some of Southeast Asia’s most famous beach resorts. The nine-day Lunar New Year holiday made February’s index of industrial production (IIP) down 16.8 percent against the previous month, according to the General Statistics Office (GSO). Two Vietnamese budget airlines signed $20.9 billion worth of deals on February 27 to purchase planes from Boeing and engines from General Electric (GE) on the sidelines of the summit between US President Donald Trump and North Korean leader Kim Jong-un. A Ministry of Transport survey claims that more than 60% of residents in HCM City support the plan to restrict cars and motorbikes in the city centre. Distance is no longer a problem for property investors in and around HCM City thanks to improved transport infrastructure. Banks and insurance companies are ramping up co-operation in selling life insurance products (bancassurance) to cash in on the high growth segment as some have posted annual triple-digit growth rates in the business. Viet Nam saw a trade deficit of US$84 million in the first two months of this year, according to the General Statistics Office (GSO). State divestment from agricultural machinery producer VEAM may be delayed by capital contribution agreements with Honda and Toyota. A Vietnamese woman fined $6,500 fine for not declaring a pork snack returned from Taiwan Wednesday without entering the territory. Talks between Kim and Trump broke down on Thursday in a dispute over how much sanctions relief Washington should provide Pyongyang in return for nuclear disarmament steps. The burning of joss paper in the form of personal items is a popular tradition around Việt Nam. The paper is burned as part of rituals to honour dead ancestors and the gods. However, as society becomes more environmentally-conscious, the practice has caused controversy. A group of artists has tried to find a solution to satisfy everyone – making the paper models smaller. HCMC will spend more than VND28 billion ($1.2 million) to clear its canals off water hyacinth, other weeds and waste. While addressing a joint Press Conference at Hanoi, after his summit, with North Korean Leader Kim Jong Un, US President, Donald Trump spoke not just about the Summit, but also the current state of US-China relations. 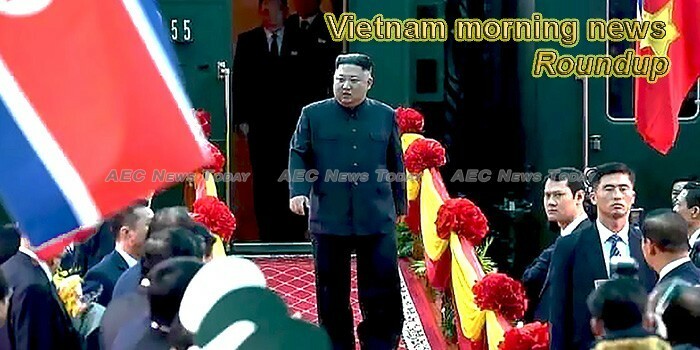 Police in Vietnam have apprehend a man for spreading faux information on social media with an attempt to incite public demonstrations during the second U.S.-North Korea Summit that took place in Hanoi earlier this week.